The “Fizz” became widely popular in the US in the early 1900s. With varying styles, a basic fizz is a variation on a sour. It’s defining feature is the use of acidic juice and carbonated water. The Texas Fizz replaces the soda water for champagne for bubbles. Here, we update it with our Navy Gin and the use of our tonic syrup instead of the less flavorful grenadine. Mix all but Wine into a shaker of ice. Shake until mixed. Strain into flute and top with wine. Add more tonic syrup for something a touch sweeter. References to the Jack Rose date back to the early 20th century. There are various stories of the origin of the drinks name. One has it named after Bald Jack Rose whos involement in the Rosenthal murder case made him famous. It’s also rumourer to b named after Joseph Rose, a New Jersey restaurateur. The most likely, is actually the simplest. It’s a combination of applejack and a rose colored simple syrup. This cocktail fell out of fashion after the 1930s. With the rise of flavored whiskeys, variations of this classic are popping up across the states. Here, we present our version with our Apple Ambush and our Tonic Syrup. It’s got a bitter lemon note with a back flavor of apple. This drink isn’t for everyone, but it’s a wonderful example of how to use our tonic for non-sweet drinks. Build in a shaker full of ice. Strain into martini glass. Adjust sweetness with the Syrup and Lemon juice ratio. Enjoy! There are a million versions of the adult Shirley Temple. Some use Ginger ale, some use orange liquor. We find that our tonic syrup has enough oompf (yes oompf) of flavor to compensate for extra ingredients. This is a very simple cocktail you can make anytime, anywhere. We highly suggest being pool, lake or riverside. Or at least in the sun. Who are we kidding, it doesn’t matter. It’s just a sweet, easy drink. Load glass with ice. Pour 2oz of Vodka over ice. Top with 4-5oz White Soda. Sink 1oz of Tonic Syrup on top. Light stir. Enjoy! Legend has it that Achilles had painted himself with a tincture of a plant to make himself invulnerable to arrows (from a magical centaur no less), everywhere but on his heel. That tincture was made with yarrow. We don’t know much about arrow invulnerability or centaurs, but we do know yarrow is a wonderful flowering plant that is native to Missouri that has many uses, one of them being a main ingredient in our Hibiscus Gin. Native American herbal medicine makes extensive use of yarrow. Among the Micmac people, the stalk was chewed or stewed to induce sweating to “break” fevers and colds. The stalk was also pounded to pulp and applied to bruises, sprains and swelling. The Cherokee, Iroquois and Mogehan peoples used it as a digestive aid. the Chinese used it in divination rituals for ages to find love. The internal and external uses of yarrow are truly endless. So now that we gave you that history, we didn’t know any of that when we noticed the flowering plant all over the state of Missouri’s grasslands. You may have thought it was a weed. It’s not. It’s a herbaceous, perennial that flowers from May to July. We found that when distilled it had a beautiful, light, rosey note to it. The taste people usueally think Hibiscus or rose tastes like, is actually yarrow. 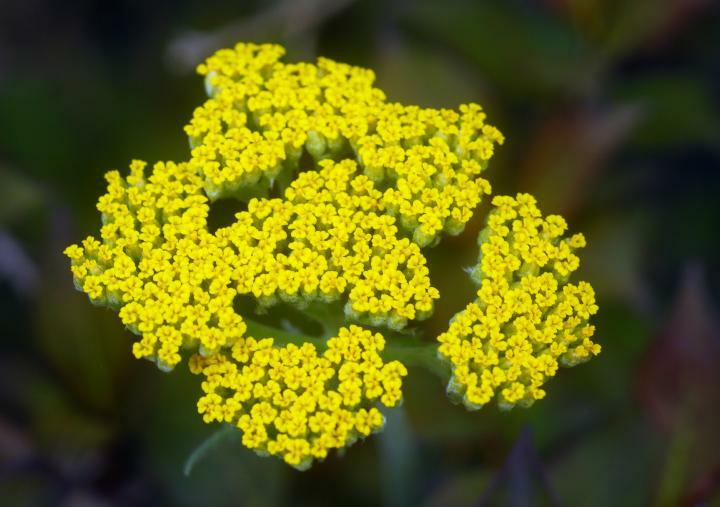 The next time you taste something super floral, we bet it has yarrow in it. 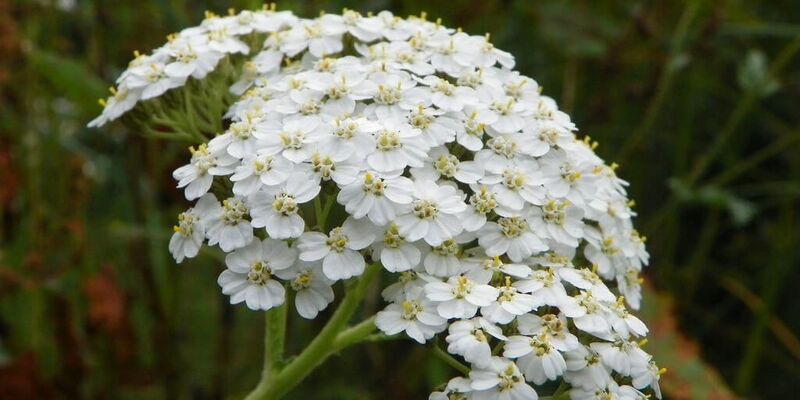 For purists, the Latin name is Achillea millefolium (yup, named after that Achilles guy). It’s long stalk grows to varying heights with clusters of tiny white or yellow flowers, that emit a characteristic aroma. Luckly, it also taste delicious. It has a sweetened brightness to it that matched other botanicals we were interested in (elderflower, juniper etc). It becomes the botanical glue that binds all other together (we’ll spare the LORT joke). It is one of the main components in our Hibiscus Gin and is one of the main reasons for it’s brighten, top note flavor profile. So whether you are into arrows, centaurs or Missouri native plants, we suggest you look into yarrow. We did and found it makes a wonderful compliment to many things – namely our Hibiscus Gin.